We can't help but love Juhi Chawla's throwback pictures and her latest Instagram post clearly explains why. The 51-year-old actress gave a perfect "Flashback Friday" treat to her fans. 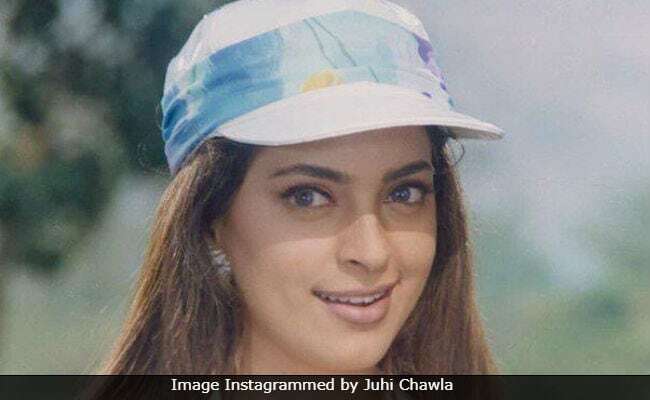 On Friday evening, Juhi Chawla shared an epic throwback picture on her Instagram profile. Though Juhi has not specified the time when the picture was clicked but the printed cap that the actress can be seen sporting in the picture, reminds us of the signature nineties fashion. We simply love her expressions in the picture but we can't decide if we love her expressions more or the caption on her post. In case you are wondering, here's what Juhi wrote: "That look when you know someone's lying and you know the truth. Social media is a funny place." She accompanied the post along with the hashtags "#FlashbackFriday." Juhi Chawla frequently shares "Flashback Friday" posts on her Instagram profile and we simply love it when that happens. Last month, the actress shared a throwback picture from the sets of a film, in which she could be seen dressed in a blue saree. "Shoes or people if they hurt you, they are not your size!! Juma'ah Mubarak! Also can you guess this film," read the caption on Juhi's post. Here are some more throwback pictures shared by Juhi Chawla. Take a look at the pictures first, you can thank us later. On the work front, Juhi Chawla was last seen in the 2016 film Chalk n Duster, in which she co-starred with veteran actress Shabana Azmi. Juhi will next be seen inEk Ladki Ko Dekha Toh Aisa Laga, co-starring Sonam Kapoor and Anil Kapoor.